I've been working on quite a few different projects here and there and I thought I'd put them up here as I go along to get input and ideas from the community, to keep me motivated. It's been a while since my last blog and the army that was the subject of that blog set me back as a painter and wargamer for a long time! Not only did doing so much in a short period of time give me back and neck problems, but it sucked a lot of the joy in painting and playing out of me. I started the Skaven project with the aim of taking it to Skulls FB that year and competing for best painted. I achieved that, and won the painting, but it made me feel like I should better that achievement. So I started a bunch of projects always trying to improve on what I did before with the Skaven. But I never seemed to get much better with it, so I lost patience and gave up, and eventually got to the point where I didn't even start painting things because I knew I'd get frustrated and give up. Along with other outside factors it made me very tired of wargaming altogether. But I kept on getting ideas, and I pulled out the Skaven occasionally, and every time I played them I remembered how much I liked them, how proud I was of them, and how much I enjoyed playing with a fully painted army on nice terrain against a good opponent. It was something of a revelation I has as I was playing against Karl Ivankovich's beautiful High Elves actually! And then I came across a quote that resonated with me: "The perfect is the enemy of the good." In other words, only accepting perfection and being too hard on yourself can stop you doing anything at all, even if it is something which is still very worthy. So with that in mind I've decided not too push myself too hard with painting. I still want to improve (and I will with more practice) but I'm not going to let it get to the point that it stops me painting guys and playing games with painted armies--which is ultimately why I'm in this hobby. I would rather be playing with a well painted army than not playing games with a brilliantly painted army I will never finish painting! So it's not about laziness or resting on my laurels, it's about getting paint brush to model and model to table, and not making it too much more complicated than that. Trophies and prizes are nice, but playing and enjoying it every week is better. This is the army I got going with, having a league at Outpost really helped push it along. I not only painted the army but a bunch of terrain too. Historical models are a new experience. A lot more models to choose from, but a far more limited palette to choose from. Having never used military colours before it was something different. Mostly done now, just a few small units left. The first historical game I played, and one I only play sporadically, but a hugely fun game. A few dwarfs, and maybe some other fantasy models here and there that grab my attention. The first project I intend to finish for 2015, a skirmish game set mid-18th century in north east America. Provincial Pennsylvanians are my first project. Last edited by Orange on Tue Dec 20, 2016 3:15 pm, edited 102 times in total. They all look awesome, and a nice variety of genres too. favourites have to be the Bolt Action and Saga stuff, although I really love the painting on all of them. Looking foward to seeing what you do with the armies! Your skaven force was amazing. Show me more! They are all so lovely and crisp. Luckily I'm not good enough to feel like I need to paint to perfection. Time (or lack thereof) is the destroyer of my hobby. That said, I love the range of hobby you have going on here. And to be clear your "meh, good enough" is my "damn, I'm awesome". Hutch--yep I'm really enjoying the historical stuff, it's a nice change after years of fantasy and sci fi stuff. Plus the "fluff" is much easier to find, and SAGA and Bolt Action are very accessible to people like me who aren't history buffs. Mikey--my method is very quick, but don't worry, I feel like that when I see the work of people like John Metzakis, Olly Paun, the Warnocks (where'd they go?) and Jiefu--who should put up some pics of his Convergance, I saw them last night and they're stunning. Knocked out my SAGA crossbowmen and peasant archers over the last couple of days as the tournament is closer than I realised! Some of you may recognise the archers--I got them at a couple of bitz nights, originally because no one makes plastic Norman archers. But they've grown on me now. And nice to put some paint on some old models! They look fantastic and those old Bretonnian Archers have come up a treat. Consider me very impressed. Very classy Normans mate. Gorgeously crisp painting as always love the flora work on the bases also Pete, straight from the Battle of Hastings! I've been busy at work on my fighting uruk-hai 1 captain and 16 scout uruk-hai nothing more than that though. Finished the just in time for the tournament tomorrow. 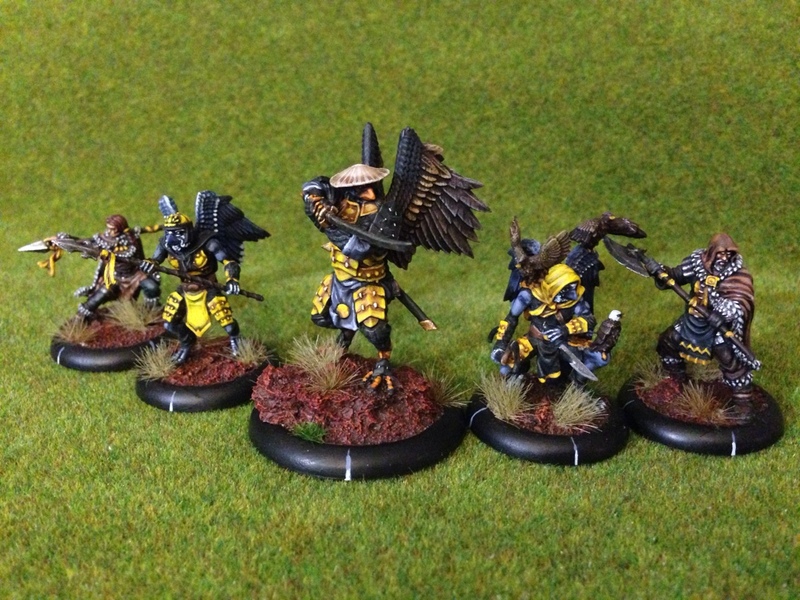 Tournaments and leagues are a great way of motivating me to get things painted. Without something to aim for, and some kind of time limit, I really struggle to get anything done. Now I need to look for something to aim for with the other 3 armies. And I'm considering putting together small second forces for Bolt Action and SAGA so that I've got two forces if people want to try the game. I'll hopefully get some good pics tomorrow. Knights and sergeants are lookin classy mate very classy. is the scarey lookin fella with the mace William the Ba...rd/Conqueror? I'm looking forward to seeing this in person those horses are so good I could almost smell them through the forums. "my little pony, my little pony----"
I especially like the bases, where did you acquire those flowery tufts from? Thanks Baz, they're battlefield tufts from The Army Painter. You can get them at Tactics. They're really easy to use and give a great effect. Fantastic looking Norman Army. Are those Conquest Games knights?